Traditional tribes Loteae (including Coronilleae; sensu Polhill, 1994) and Robinieae (sensu Lavin and Sousa, 1995) comprise the "Robinioid clade". Loteae, consisting almost entirely of herbaceous annual/perennials or small shrubs distributed in the Mediterranean region and to a lesser extent in North and South America, has been traditionally considered closely related to other temperate, largely herbaceous Old World tribes, especially Galegeae as part of Dormer's (1945) 'epulvinate series' (Polhill, 1981). Robinieae, which is primarily a group of tropical and arid temperate trees and shrubs restricted to the New World (except for the pantropical Sesbania), has been considered related to Dalbergieae, Aeschynomeneae, and Millettieae. The circumscription of Loteae was expanded by Polhill (1994) to include all genera formerly placed in tribe Coronilleae (Polhill 1981), which had been distinguished by the presence of lomented fruits and branched root nodules, features not observed in Loteae sens. strict. The merging of Loteae and Coronilleae is supported by both molecular and morphological data (e.g., Diez and Ferguson, 1990, 1994, 1996; Allan and Porter, 2000; Allan et al., 2003). Sesbania is a pantropical genus of c. 60 species of herbs, shrubs, or trees (Lavin and Sousa, 1995) and of interest because of its unusual preference for seasonally wet, or flooded habitats, and the occurrence of "stem"-nodulation in some species (nodules are formed at adventitious root primordia on the lower stems) (Goormachtig et al., 2004). The treatment of Lavin and Schrire (2005b) now recognizes the separate tribe Sesbanieae, comprising one genus, Sesbania, and a more restricted tribe Robinieae with 11 genera and 72 species (Lavin and Schrire, 2005a). The robinioid clade includes tribes Loteae sens. lat. (incl. Coronilleae, sensu Polhill, 1994), Robinieae (Lavin and Schrire, 2005a), which are distributed primarily in the New World, northern Africa, and Europe, and the recently resurrected tribe Sesbanieae (Lavin and Schrire, 2005b). 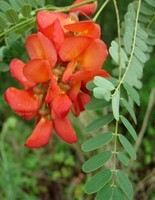 Within this clade, the pantropical Sesbania L. (Sesbanieae) is monophyletic and weakly resolved as the sister group to Loteae sens. lat., a finding first suggested by a preliminary analysis of matK gene sequences (Wojciechowski et al., 2000) and later supported by an exhaustive sampling of additional matK sequences (Lavin et al., 2003; Wojciechowski et al., 2004). Evidence (nuclear rDNA ITS sequences) for Sesbania as the sister group to the remaining Robinieae, rather than to Loteae sens. lat., has also been reported by Lavin et al. (2003). Based on these molecular phylogenetic studies of robinioids (Lavin et al., 2003; Wojciechowski et al., 2004), Sesbania is either sister to remaining members of Robinieae, or to Loteae sens. lat. and together they form a weak-supported sister group to the remaining Robinieae. Resolution of this uncertainty in relationships among the major lineages of the robinioid legumes is a subject of active investigation. The most recent phylogeny of Loteae sens. lat. provides molecular evidence for its monophyly but suggests the large genus Lotus, which includes the genetic/genomic model Lotus corniculatus L. subsp. japonicus (Regel) H. Ohashi, is paraphyletic (Allan et al., 2003). In that analysis, Old World Lotus is a moderately supported monophyletic group (if the genera Tetragonolobus and Dorycnium are included), while New World Lotus is paraphyletic. Relationships within a recircumscribed Robinieae, which includes genera such as Robinia L. (black locust), Olneya A. Gray (ironwood), and Coursetia DC., have been resolved by recent, comprehensive molecular phylogenetic analyses (Lavin et al., 2003). Allan, G. J., E. A. Zimmer, W. L. Wagner, and D. D. Sokoloff. 2003. Molecular phylogenetic analyses of tribe Loteae (Leguminosae): implications for classification and biogeography. Pages 371-393 in Advances in legume systematics, part 10, higher level systematics (B.B. Klitgaard and A. Bruneau, eds.). Royal Botanic Gardens, Kew, UK. Diez, M. J., and I. K. Ferguson. 1990-1996. Studies of the pollen morphology and taxonomy of the tribes Loteae and Coronilleae (Leguminosae: Papilionoideae). Part 1. (1990) Lagascalia 16: 77-94; Part 2. (1994). Review of Palaeobotany and Palynology 81: 233-255; Part 3. (1996). Review of Palaeobotany and Palynology 94: 239-257. Goormachtig, S., W. Capoen, and M. Holsters. 2004. Rhizobium infection: lessons from the versatile nodulation behaviour of water-tolerant legumes. Trends in Plant Science 9: 518-522. Lavin, M., and B. D. Schrire. 2005a. Robinieae. Pages 467-473 in Legumes of the world (Lewis et al., eds.). Royal Botanic Gardens, Kew, UK. Lavin, M., and B. D. Schrire. 2005b. Sesbanieae. Pages 452-453 in Legumes of the world (Lewis et al., eds.). Royal Botanic Gardens, Kew, UK. Lavin, M., and M. Sousa. 1995. Phylogenetic systematics and biogeography of the tribe Robineae (Leguminosae). Systematic Botany Monographs 45: 1-165. Polhill, R. M. 1981. Papilionoideae. Pages 191-208 in Advances in legume systematics, part 1 (R. M. Polhill and P. H. Raven, eds.). Royal Botanic Gardens, Kew, UK.